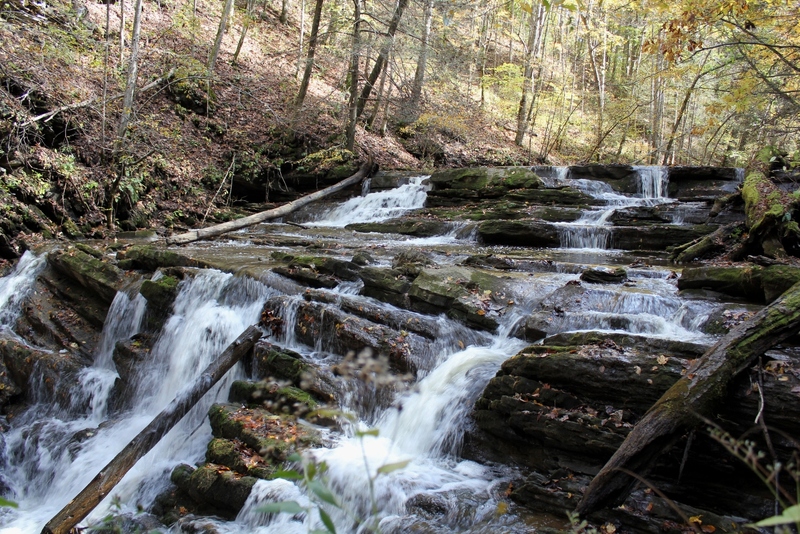 In Washington County, Virginia, less than a score of miles from Abingdon, is one of the most impressive series of waterfalls in Virginia. This October the owner of Abrams Falls, who is an acquaintance and client of mine, graciously took my son Karl and I for a viewing and photography shoot of the falls. This is a special place worthy of protection and preservation. It’s almost hard to believe such a natural formation exists on private property, right in the most populous county in Southwest Virginia, unknown to most people who live here. 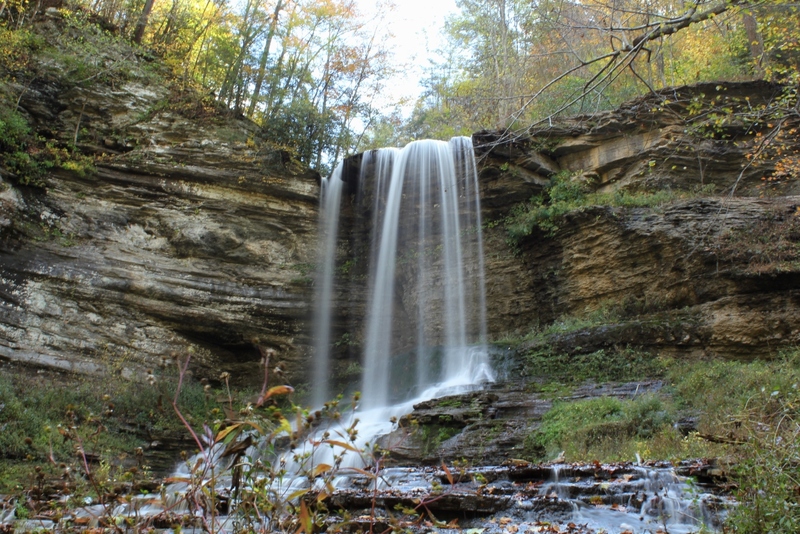 There is a series of waterfalls here, the major of which is a plunge-type waterfall of about 70′ that continues with a secondary cascade waterfall that drops over a series of ledges for another 15 or 20′. 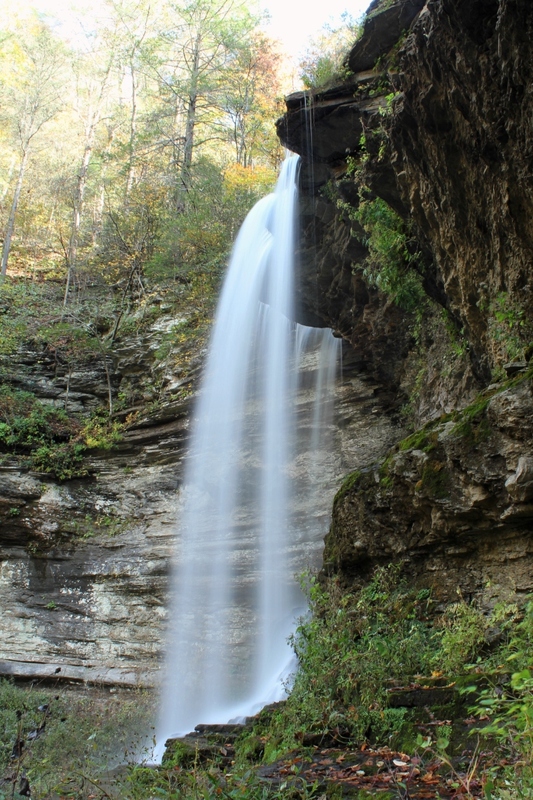 The main falls drop into a large, natural amphitheatre of sedimentary rock that forms a semicircle of 180°. Below the falls, Abrams Creek continues to flow through a 500′ deep, extremely steep, horseshoe-shaped gorge for over 1/2 mile. The size of these falls can be appreciated in the photo above. Note the boy in the foreground on the right of the photo; he is almost 100′ from the base of the falls. Abrams Falls create their own micro-environment. Mist and moisture at the base of the falls make for conditions that allow certain rare plants to grow. 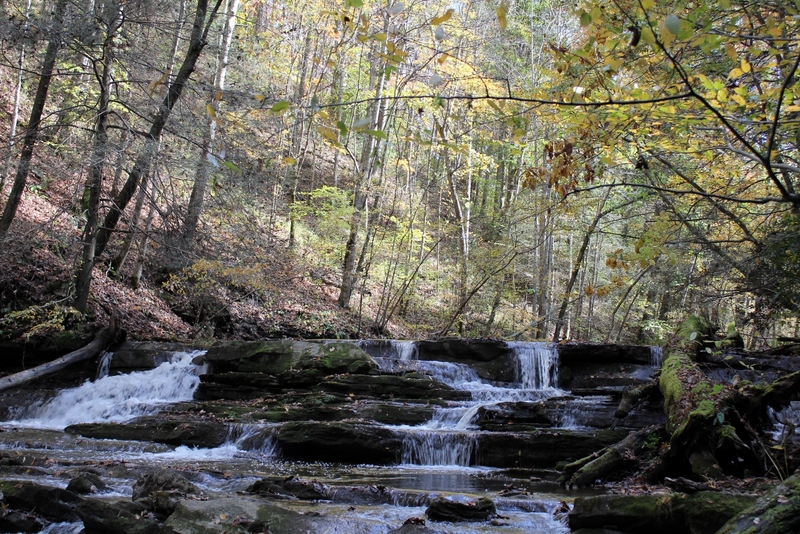 The falls are located on private property not currently open to the public. There is no road directly to the falls. To get to the falls, one must hike in for about a mile. There is not any developed trail to the falls. There are two semi-trails that property owners and trespassers have used. 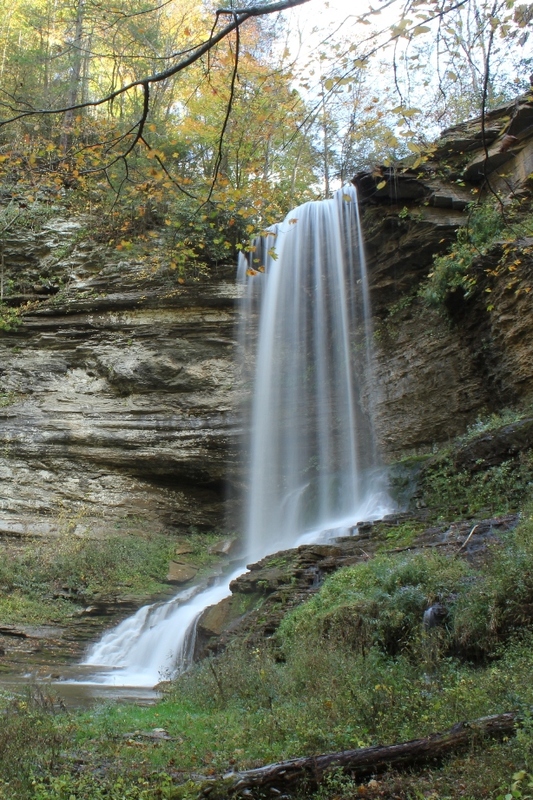 Numerous trespassers have died or been injured over the years trying (without permission of the landowner) to see the falls. 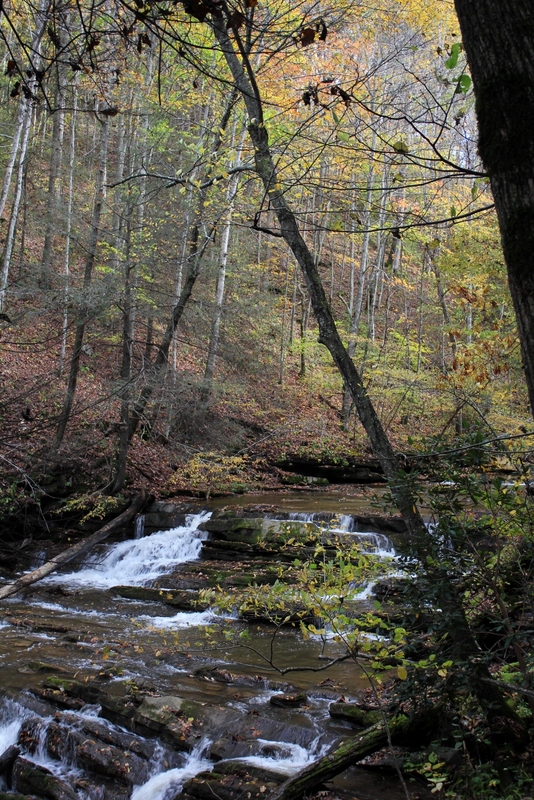 Abrams Creek has several additional noteworthy falls. On our hike, we passed the first, unnamed cataract below. The fall colors were either at their peak, or just slightly past their peak, and made for a great backdrop. There is another waterfall, I will call it the Upper Abrams Creek Falls, and it is impressive in its own right. 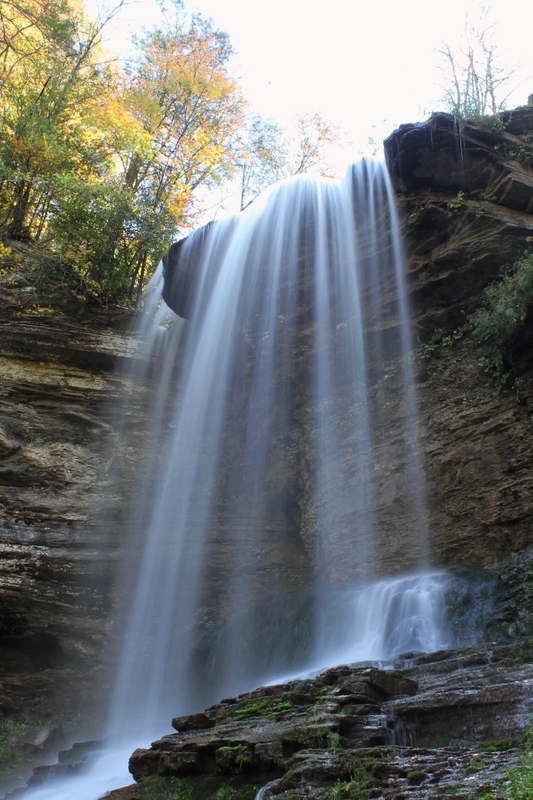 It is about a 15-20′ cascade waterfall that spans about 40 feet across. It is at the Upper Falls that the mountains begin to close in to form the gorge. 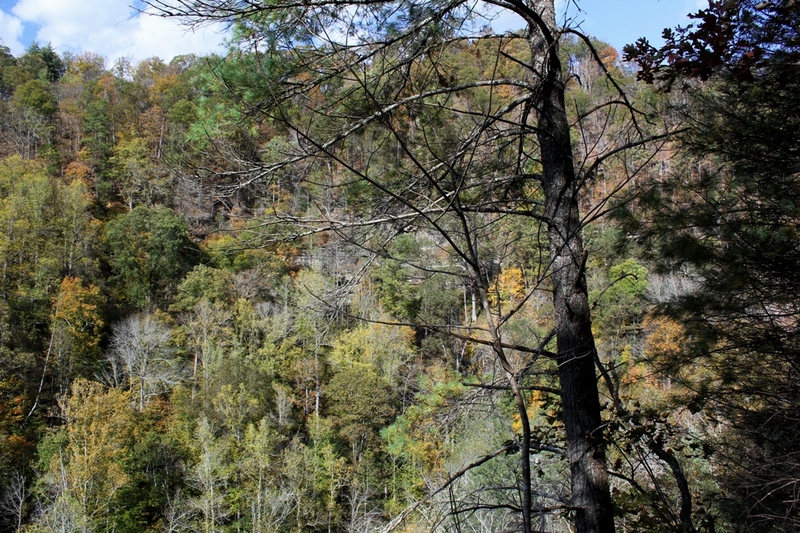 The mountainsides become quite steep downstream from the Upper Falls. Our hike left Abrams Creek at this point, and we began to climb up the mountainside in order to take a safer way to the main falls. This path also allowed us to better view the horseshoe-shaped gorge. The hiking here was strenuous. The photograph below shows the opposite side of the gorge. This gorge is so closed in that it is difficult to photograph in a way that conveys how steep and deep it is. It reminded me of a miniature version of the New River Gorge in West Virginia, or perhaps even more the Russell Fork Gorge. 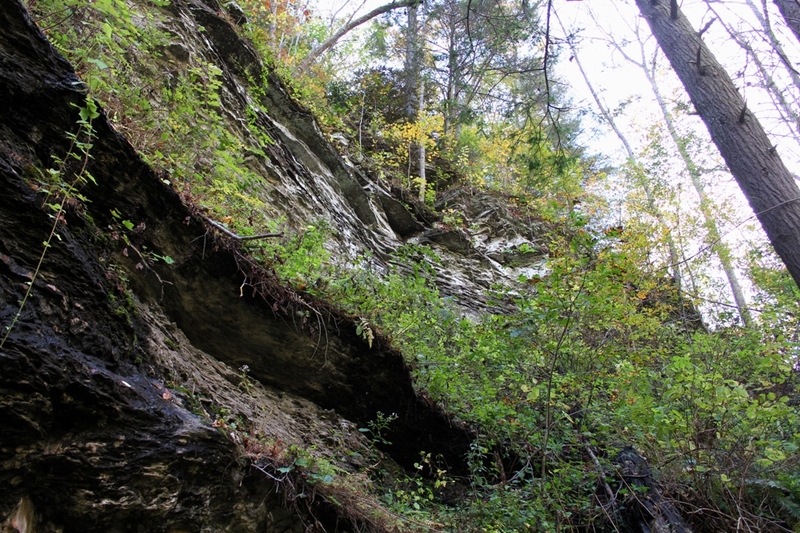 There are rock outcroppings and cliffs on both sides of the Abrams Creek Gorge. Abrams Creek flows about 500 vertical feet below the highest point of the trail. We traveled to a point at the top of the mountain that allowed us to view the horseshoe shape of the gorge, and then we began our descent into the amphitheatre where the main falls are located. This descent was quite steep. As we descended, we could hear the ever-increasing sound of the falls crashing on the rocks below. 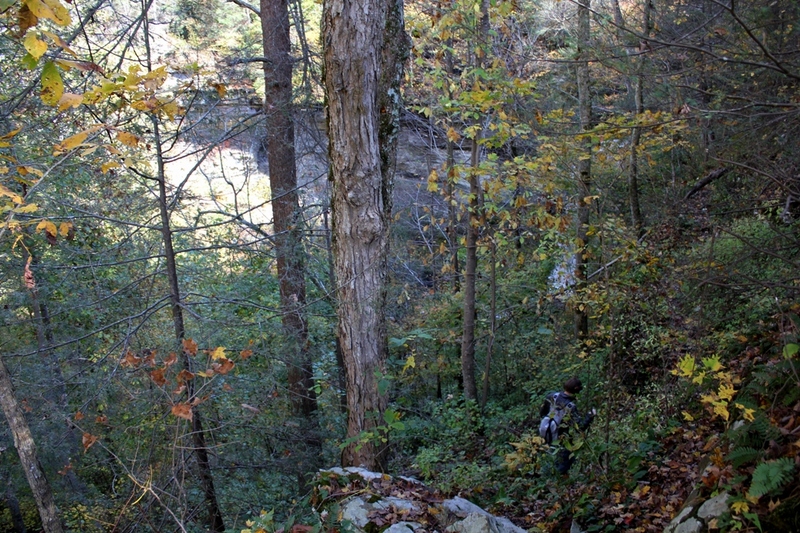 In the photo below, the property owner leads the way down the path toward the falls. 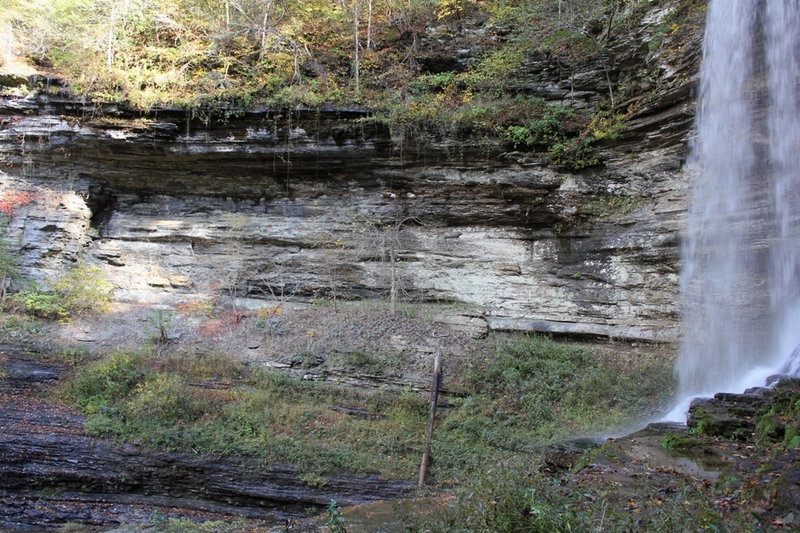 The amphitheatre is formed by 70-80′ cliffs that surround the falls. The photo below is from about 3/4 of the way down into the amphitheatre and shows the steep cliff face. 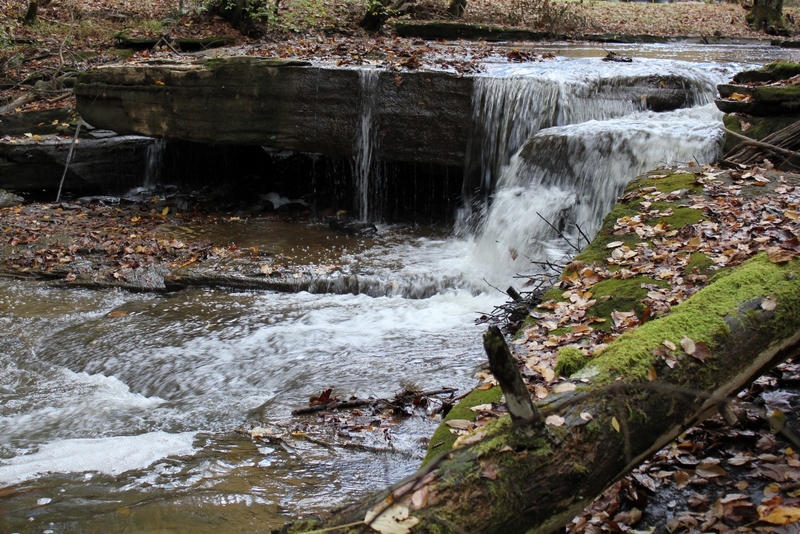 When there is high water, the force of the creek and the falls must be incredible. In the photo below, you can see a large tree that is up against the opposite canyon wall. This tree was about 35′ in length, and could not have been moved even if we had tried to do so. There were several large, ordinarily immovable pieces of wood that looked like they had been thrown around down into the gorge. It reminded me of the way you might see random timber lodged against the walls of a Southwestern U.S. slot canyon from flash floods. I would surmise Abrams Creek is also susceptible to flash flooding. 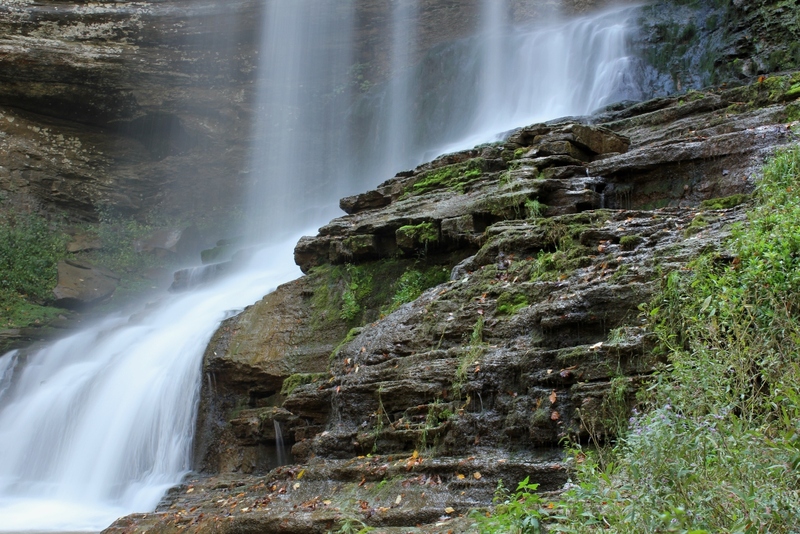 While the main plunge is the central scenic feature, the cascades at the base complement it and complete the falls. In the front-on photo of the falls below, you can see how the cascades spread out beneath the plunge. The falls are a true plunge-type falls. Viewed from the side, they look like a bridal veil. There is actually room to get behind the falls, but the rocks are extremely slick, and it would have been dangerous to approach any closer that we did. The mist from the falls can be felt 50′ from the base of the falls. The roar of the falls at the base of the amphitheatre makes conversation difficult. 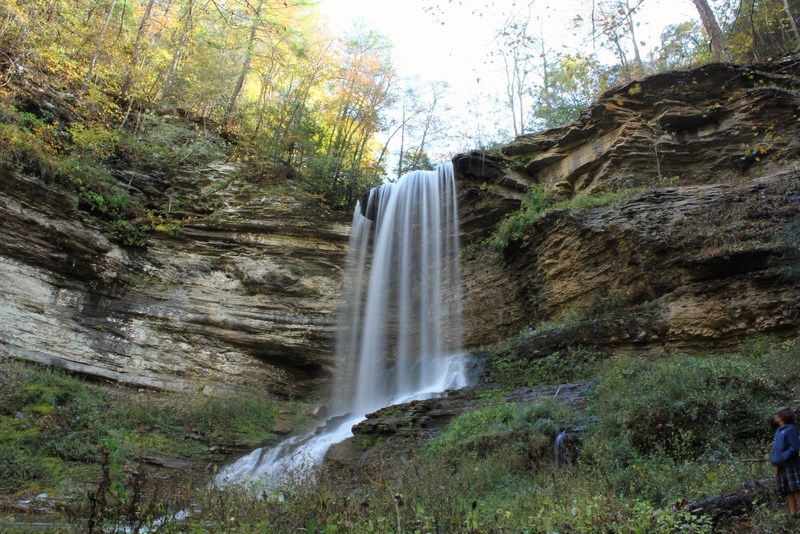 The whole experience of being at these falls—a completely natural, pristine, and extraordinary place so close to Abingdon—was quite remarkable. NOTE: The photos here are published with permission of the landowner. Please enjoy these photos, and at this time appreciate this place through them. These falls are not on public property. It is illegal to trespass on private property in Virginia. This trip and photo shoot was conducted at the invitation of the landowner. The general public is not invited to visit the premises at this time. 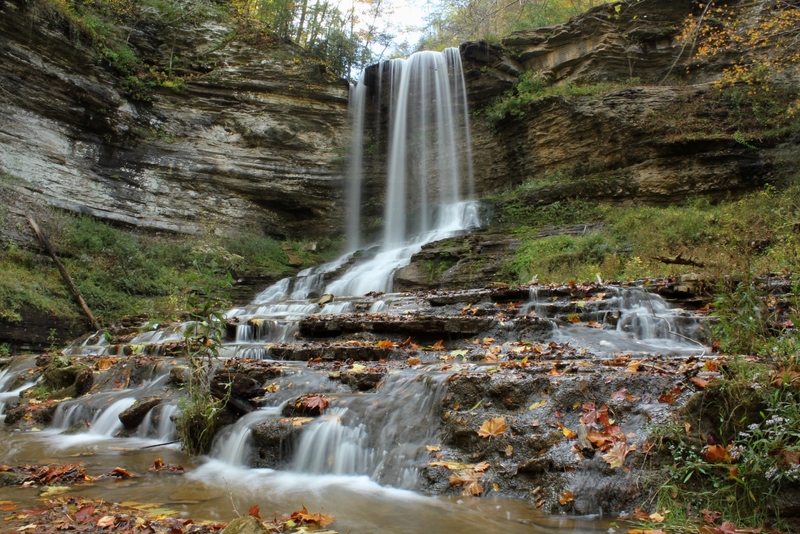 There have been fatal and other serious accidents involving illegal trespassers at Abrams Falls. Respect the landowner of this property, and do not attempt to visit the falls unless you have permission.